Think of Sanibel Island and you think FISHING - at least many do. For those Sanibel Island lovers, please be advised that the City of Sanibel will be doing some repairs to the pier from 9/21 - 10/5. It is important to keep this treasure in good form. The official notice from the City of Sanibel is below. 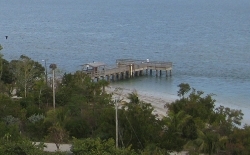 "On Monday, September 21, 2009 the City of Sanibel will begin repair work to the City Fishing Pier and construction will continue through October 5, 2009. The City Fishing Pier will not be available for use during this construction project. We apologize for any inconvenience you may experience while this important public improvement project is completed." The project involves the removal and replacement of wood decking, hand rails, and other miscellaneous items. The City of Sanibel has contracted with Bridge Masters Construction, LLC to perform this work. The Lee County Tourist Development Council (TDC) is providing funding for this project. Anyone with questions regarding the City Fishing Pier Repair Project is invited to contact the City of Sanibel Public Works Department at (239) 472-6397. You can also check the Sanibel Government Website for more information.